AM Morales González (2018): “Development of audiovisual production companies in Extremadura in the 21st century”. Revista Latina de Comunicación Social, 73, pp. 790 to 809. Introduction: In the early 21st century, the Spanish Autonomous Community of Extremadura only had six audiovisual production companies that were operating in a regular basis and focused mainly on the production of institutional video and advertisement. Seventeen years later, as a consequence of the emergence of Extremadura’s regional public television network, the number of production companies quadrupled. However, they continued to be small and medium-sized enterprises with a small workforce that increased temporarily according to the production demands of the moment. Methods: This study combines quantitative and qualitative approaches, based on interpretive, documental and theoretical tools as well as interviews. Results: The development of production companies in Extremadura has been progressive and limited because they have had relationship of dependence with the regional public television network and, thus, their annual revenue depends almost completely on the services requested, under contract, by the regional network. System; structure; Extremadura; media; political power; economic power. 1. Introduction. 1.1. Hypothesis and objectives. 1.2. Structure and system. 1.3. Importance and contributions. 2. Methods. 3. Results. 3.1. Stages of Canal Extremadura Televisión. 3.2. Analysis. 4. Conclusions. 5. References. The Autonomous Community of Extremadura is located in the southwest area of the Iberian Peninsula and has the two largest provinces of Spain: Cáceres and Badajoz. The province of Cáceres is predominantly rural, while Badajoz has an intermediate status, according to the 2014-2020 Rural Development Programme. This Spanish region has a mountainous terrain and spacious peneplains, river cliffs and fertile meadows. This vast territory is divided into 380 municipalities and has a population of 1,087,778 inhabitants (INE, 2016). Almost 60% of the population live in towns with less than 20,000 inhabitants. Data that suggests that Extremadura has great geographic dispersion, low population density and a high number of municipalities. In terms of activity in the region, the primary sector has historically configured the economic and cultural development, although at the end of the 20th century the services sector began to increase its weight in the productive structure of Extremadura (Vacas, 2005). Extremadura’s economy has a fragile production structure that only accounts for 2% of the companies operating in Spain (El Periódico de Extremadura, 2014, 18 August 2017). Having described the Autonomous Community of Extremadura, it is important to note that, like other sectors within the region, the development of the audiovisual sector has not been characterised by a solid and up-to-date evolution but quite the opposite. Among others, the demographic and economic characteristics of the region have influenced this situation, given that the decentralisation of most municipalities makes Extremadura’s media unable to meet the wide demand of all its inhabitants (Vacas, 2005). At the beginning of this century, the region had only six audiovisual companies that operated normally and focused on the production of advertising and institutional videos, having as a majority customer the Regional Government of Extremadura: The Junta of Extremadura (Vacas, 2005). All of these companies were small and medium-sized enterprises that employed about 150 workers, including permanent and temporary employees that depended on production demands. According to Vacas, at that time, this situation was provoked by the opposition of the government’s executive branch to the creation of a regional public television corporation, the limited in-house productions of the Spanish Radio and Television Corporation in the region and the lack of exchange of products between local television companies. According to Francisco Morillo, director of Mérida’s local television channel Televisión Extremadura, for the then President of the Junta of Extremadura, Juan Carlos Rodríguez Ibarra, it was not necessary to create a regional public television network because he had already won six elections and did not need more advertising (F. Morillo, personal communication, 28 April 2016). Juan Carlos Rodríguez Ibarra was the President of Extremadura since the establishment of the Statute of Autonomy, in 1983, until 2007. He was President during six legislatures, i.e., 24 years in which he did not see the need to create a television network as an instrument for the dissemination of the achievements of his government. Despite this opposition during the 1990’s, eventually in 2000 the Government passed the Law 4/2000, of 16 November, for the creation of the Extremaduran Public Corporation of Audiovisual Media (BOE, 2000), known as the Law for the creation of public television. However, it was not until 2006 when the new corporation began broadcasting for the first time under the name “Canal Extremadura Televisión”, also known as “Canal Extremadura TV”. Nonetheless, this was not the first regional television experience in the community. On 9 July 2001, given the broken negotiations between the PSOE and the PP to create a regional television corporation, Ibarra signed with the then President of the Junta of Andalucía, Manuel Chaves, a protocol of intentions, which subsequently allowed the broadcast throughout Extremadura of Canal Sur, which for several hours broadcast region-exclusive content. This project started in September 2001 and ended in June 2002, so it did not even last one year. The shut-down was caused by a sentence of the High Court of Justice of Extremadura, which concluded that the outsourcing of the network’s own contents to an audiovisual production company had violate fundamental rights (El Periódico de Extremadura, 2002, April 14, 2017). The end of Canal Sur Extremadura meant a new beginning for the negotiations between political parties to launch a regional public television network, given that most of the Spanish autonomous communities already had their own. According to Mónica Hinojosa, who has researched Spanish audiovisual production companies, the role of the communication channel is essential “to reach the viewer”, who “determines what to produce and how”. Although Hinojosa’s results focus on production companies from Madrid, they may well be applied to the other autonomous communities in Spain. She insists in this sense on the role of the communication channel: “production companies to a greater or lesser extent always have to succumb to the desires and interests of these media” (Hinojosa, 2005). Thus, the birth of the regional public television network was an important milestone in the evolution of these audiovisual companies, as it became a new customer, a new channel of communication, which demanded a lot of audiovisual products to fill its daily offer. Most of these companies also played a key role in the emergence of this regional public television network, since they participated in the drafting of the law. This participation involved meetings with political groups and deliberation conferences (J. Camello, personal communication, 25 May 2017). Since its inception, the daily programming of Canal Extremadura TV included over 90% of external productions since it only produced part of its daily news programmes (P. Sánchez, personal communication, 29 June 2016). “naturally proliferated. The development of the sector has been, since then, relatively consistent with the increase in resources and the visibility of the productions […], They are not many, between 30 and 40 million euros per year, but it is more than the amount that moved the sector prior to 2006” (J. Camello, personal communication, 25 May 2017). For all these production companies, Canal Extremadura Televisión became the primary client. For example, the audiovisual company Trovideo stated in its 1994-2007 report that “in 2005, 2006 and 2007 Canal Extremadura Televisión had become one of the main customers” (Trovideo Comunicación Audiovisual, 2007). However, Canal Extremadura Televisión did not only became the main customer in its beginning. In fact, this practice has continued until now in all the production companies. Some members of the sector, such as Pablo Sánchez, director of the regional television network between 2006-2010, claims that this television corporation “has been and still is the engine of the sector”, but there is a great dependence of the production companies on the regional channel, in such a way that 90% of their activity are contracts with the public channel and the remaining 10% are advertising spots for the Junta of Extremadura. Sánchez points out that “this is not healthy… [as] these production companies do not have the resources to survive when Canal Extremadura stops requesting their services” (P. Sánchez, personal communication, 29 June 2016). Therefore, in 2000 the audiovisual sector was poor, and the local television and radio stations played a protagonist role due to the shortage of audiovisual production companies, not only in quantitative terms but also in terms of production and customers. Thus, this year witnessed the start of the negotiations about the creation of the regional channel and the beginning of the end of Canal Sur Extremadura. “were born in Spain prey of a straitjacket that forces them, on the one hand, to move to the rhythm of the political and partisan changes and, on the other, to compete for the market of advertisers with the rest of stations” (2002, Albornoz). This competition influenced the contents of regional television channels which sought to compete with mainstream channels and increase their audience share, and these needs conditioned the hiring of audiovisual production companies. It is the regional network who determined how and when. Based on the previous, this research aims to establish the causes, consequences and extent of this development over the years to assess the positive and negative aspects of these audiovisual production companies and to be able to improve their activity. This study is innovative and pioneering because there is no research in this area and it can become an object of study for the students of the School of Documentation and Communication Sciences of the University of Extremadura. The main hypothesis of this research is that: the development of audiovisual production companies in Extremadura has been conditioned by the decisions made in the media sector by the executive branch of the regional government. The executive branch of the government in the community of Extremadura is the Junta of Extremadura, regardless of the political parties that govern at a given time. During these seventeen years, the region has had five legislatures, four ruled by the Socialist Party and one by the Popular Party. The change of party in the government also meant a change in the general direction of the Extremaduran Corporation of Audiovisual Media (CEXMA) and, therefore, a new twist in the direction of the company which resulted in a new business policy with new content and new procurement rules, among other aspects. Therefore, we propose that during all these years the production of audiovisual production companies has been at the service of the political power. The decisions made by this power in the media sector in the region have conditioned the development of the sector and, therefore, the development of production companies, such as for example, their creation before and after the emergence of the regional channel, the launch of Canal Sur Extremadura, the subsidies and aids granted to these audiovisual production companies, the contracting and procurement models to work for the regional administration, and the procurement models to generate content for the regional television network, etc. Thus, based on the previous, to determine the causes and consequences of the development of audiovisual production companies, we will investigate each of these companies with an emphasis on their size, activity and customers. In the same way, we will study the changes that the birth of the regional television channel produced in them. We will discuss how audiovisual contracts between these companies and the regional network were produced. And, finally, we will compare their individual and collective development during these years. By fulfilling these objectives, we will be able to determine whether our hypothesis is confirmed or not. The description of Extremadura, with its limitations and the factors that have influenced the development of audiovisual production companies over the past seventeen years (like the executive power), indicates that our object of study is framed within the areas of media economy and structure. At this point, it is necessary to consider the fundamental aspects of these two areas to understand the functioning of the audiovisual production companies within a greater structure that responds to a series of rules, which could be called a system. First of all, we should clarify two concepts: structure and system. Ramón Reig defines the concept of structure as: “a series of articulated elements, i.e., interconnected, organised, in a way that if one or several of them suffer alterations, the set will be affected” (Reig, 1998, p. 19). Thus, in a structure, it is essential for the distribution of elements to be interconnected. This interconnection should be both horizontal and vertical while the alterations or modifications may be positive or negative, in such a way that it is necessary to be able to anticipate them. Therefore, we can understand that audiovisual production companies are an element within a structure that might be called: the Extremaduran audiovisual sector. This sector encompasses these audiovisual companies, but also: the local television stations, radio stations, online media, regional television channels and associations of professionals from the sector, etc. Each and every one of them are elements that make up a structure in which they are interconnected. A clear example is the production company Zafra TV Producciones, which generated content for its own local television channel, but also for the regional channel. Here, there is a connection between three elements, and if one of them disappears it will cause changes and have consequences on the remaining two. This is just one of many examples. However, any structure responds to a series of rules that constitute the system. Continuing the road towards the concept of system we can highlight the following statement by Sánchez-Bravo: “structuring is that which, by itself, engenders a systematisation” (Sánchez-Bravo, 1992, p. 74). In this sense, Reig examines the aspects identified by Urabayen within a system. Among them, Urabayen highlights that a system is a variety of elements with specialised functions and that these elements are organised in structures (Reig, 1998). This suggests that a system is composed of structures, which, in turn, consist of elements. The different elements that make up a structure, as we have seen, are interrelated, just like the different structures that make up a system. Therefore, Sánchez-Bravo rightly states that structuring engenders a systematisation. However, system is broader than structure as a concept, it is in an upper stage. It is understood, for example, when speaking of the economy market, composed of economic, social and information structures. Therefore, the system covers structure and not the other way around, although the appearance of the various structures and the interrelation between them, cause the emergence of the system. Thus, the structure formed by the Extremaduran audiovisual sector responds to a series of rules, which in this case can be political, economic and social. These rules, as we have pointed out, make up the system that governs the whole structure and in turn, the elements that compose it, which in this particular case are the audiovisual production companies. Therefore, an Extremaduran audiovisual company of about 10 workers plays by these rules in its every-day operations, even without being aware of it. The owner of this company should consider, firstly, what product to offer based on what is already on the market, which in its competition, developed between all the elements that compose it. Its product requires production that involves an economic, labour and creative expenditure, which can be compensated or not by the buyer of the final product. This buyer has put his own conditions in the contract, which may be equal or different to those of his competitors. There, the owner must decide whether he agrees to these terms and conditions, must analyse whether they are beneficial to his business and, where they are not, whether they can be beneficial on the long run. Economic, social and political factors influence the day-to-day operations of the Extremaduran production companies. Economic, because a producer seeks the benefit for his company, not just getting contracts and selling their products, but also receiving subsidies and aids offered by the regional or national governments. Social because, in most cases, the producer generates a product that is aimed at the Extremaduran population, so he must know it to get his message across, either through a public service announcement or through a magazine show on regional television. And political, because the Junta of Extremadura is the main customer of each of the audiovisual production companies in the community, through either of its different departments or through Canal Extremadura Televisión. Having raised the fundamental aspects of the structure of information, we can get into the field of media economy. This discipline analyses, on the one hand, the economic nature of the media and its relationship with the wider social structure and, on the other hand, observes how ownership, financing mechanisms and public policies influence media content and behaviour. In this sense, according to Mosco (1996), political economy has consistently inspired the unification of the political and economic realms, as it has realised their mutual influence and relationships with the wider and more symbolic areas of social activity. In addition, structuring is identified as a fundamental element (Mosco, 2006). The relationships presented by Mosco are the rules and principles that govern the structures, the concept that we have already defined as a “system”. We must bear in mind that the power structures have existed throughout history, but with the passage of time the forms and modes of communication have changed. However, it was not until 1960 when Dallas Smythe published “On the Political Economy of Communications”, which presented one of the first applications of political economy to the communication field and defined this approach as the study of the economic processes and communication policies, and their interrelation and mutual influence on other social institutions (Segovia, 2006). It is evident, therefore, that to be able to know the causes and consequences of the development of audiovisual production companies, we must investigate and study them not only individually, but also the relationships with each other and with the rest of the elements that make up the structure of which they are part. Similarly, it is necessary to understand the operation of this structure, i.e. the system: the political, social and economic principles that govern it and the changes that produce these principles in the structure. According to Eurostat (2015), Extremadura is one of the poorest regions not only in Spain but throughout the European Union, with “a GDP per capita of 68% of the EU average” and a place “among the 25% of the poorest of the 28 countries” (El País, 2015, 29 October 2017). These economic conditions, together with the above demographics have conditioned the development of the region, not only in the audiovisual field, but in all aspects. To this we must add that, historically, Extremadura has been one of the most forgotten Spanish regions in economic and political matters by the Central Government, and this oblivion also translates into a lack of study and research in all subjects, although in our case, we will focus on the audiovisual field. There are very few studies on the audiovisual sector in Extremadura, and less specifically on production companies. We have only found one important research on this subject: Francisco Vacas’s PhD dissertation “Television in Extremadura: a project of regional television (2005)”, as well as some articles written by the author, which explore audiovisual production companies in the region. However, these publications focus on the years prior to 2000, so that there are no studies on the evolution of these audiovisual companies in the 21st century despite the milestone set by the birth of the regional public television network. Vacas’s research will help us outline the background of our study of what has happened in recent years. This research combines interpretative quantitative and qualitative approaches. The qualitative study is based on interviews with various agents that are directly related to the audiovisual production companies in the region, such as, their CEO and workers. These interviews have helped us to learn about the history of each of the audiovisual companies, their objectives, customers, productions, as well as their views on the state of the sector and the elements that compose it. These elements have direct contact with audiovisual companies and have influenced their evolution. Moreover, we have studied different communication policies passed by the five legislatures in the last seventeen years in the Extremaduran region. To draw the background and know more details, we resorted to the few publications related to our research, newspaper archives, official publications such as the Official Newspaper of Extremadura (DOE), the Official Gazette of Spain (BOE), numerous articles published in online and print media with information relevant to our study, as well as publications related to the disciplines of our object of study: Media structures and media economics. We have analysed the legal framework of the production companies and their relationship to each other, through a diachronic and synchronic perspective, and their individual history and development, taking into account the external conditions that surround them. To get this information, collected through interviews and documentary and theoretical research, we have used empirical methods, such as observation, measurement and experimentation; theoretical methods, such as deduction and induction; and historical methods, to analyse events in relation to others. Finally, we have used analysis and synthesis to understand the relationship between all the elements that make up the structure and be able to corroborate our initial hypothesis. This interpretive methodology contains all the elements necessary to study and analyse an object of study of these features. As noted in the introduction, in the year 2000 only six audiovisual production companies operated in Extremadura: Trovideo (1994), Iris Eyex Producciones (1987), Libre Producciones (1988), Grupo Ros (1995), Extra Extremadura (1995) and Martín García Chamorro (1990). Their activity focused mainly on the production of institutional and advertising videos, since they did not have a working relationship with local broadcasters in the region, except in specific cases, and the territorial centre of Spanish Radio Television in Extremadura required very little collaboration. Only two of them tried to open the market beyond the borders of Extremadura offering, especially, Extremaduran news coverage to mainstream TV networks, as well as several documentaries and news reports. Trovideo had his first big production for a television channel with the programme “Mi Tierra” for Canal Sur Extremadura. After the disappearance of this channel, Trovideo returned to the production of corporate videos and political campaigns. However, this collaboration with Canal Sur Extremadura served as a showcase for Canal Extremadura TV. In 2004, Trovideo partners with Tragaluz - an Extremaduran audiovisual production company dedicated to the production short and features films - and SODIEX (Society for the Industrial Development of Extremadura). SODIEX is an autonomous instrument that supports the growth of existing businesses or the launch of new business initiatives, by financing public limited companies and limited partnerships, forming part of the share capital in minority and temporary ways, to provide companies with the appropriate financial structure to work properly. This society was formed to achieve sufficient economic resources to respond to the demands that would emerge with the launch of Canal Extremadura TV. Later, Trovideo received the support of regional institutions, such as the Business Corporation of Extremadura (CEX) and AVANTE which share the same objective as SODIEX: promote the industrial and business development of Extremadura. Thus, Trovideo, with part of its public capital, has been and is one of the best positioned companies in the contracts of regional television. Since 1987, Iris Eyex Producciones became one of the most established production companies of the Extremaduran audiovisual industry: it produced a large number of newscasts for Spanish national and regional networks, created three temporary emissions of local television, produced more than 500 advertising campaigns in Spain and Portugal in the early days of Canal Extremadura, developed the institutional advertising of the network and two programmes. Despite this, in 2008 it disappeared due to the unbearable structural costs. Today, after the disappearance of Iris Eyex Producciones, Libre Producciones is the dean of the region. It has two partners and an annual average turnover of 180,000 euros. Throughout its history, it has created television series, documentaries, short films, but above all informative and commercial contents. Currently, its main customer is Canal Extremadura TV, which means that an average of 60% of its annual production is for this channel. This company has also received grants and regional subsidies for film and documentary work. Grupo Ros started as an audiovisual production company, although its main activity is being a communications agency. Despite this, it has had presence with some of its formats since the beginning of Canal Extremadura TV until today. Extra Extremadura Audiovisuales is based on Badajoz but originated in the Basque Country. It has produced some television programmes, although it currently focuses on television series and films, having little presence in in television, except for the series, “Técula Mécula”, produced for the regional channel since 2012. Martín García Chamorro, who later named his company “Malesgu”, created this company linked to a local television channel, TelePlasencia. During its early years, it focused on content for this local television channel and the production of few other programmes for national networks, although its main customer would be Canal Extremadura Televisión, in which it has been present with more than 5 different formats since the beginning until now. Two new production companies appeared in 2001 and 2002. They were linked to the local television channels, Zafra TV Producciones and Producción Audiovisual del Norte de Extremadura (PANEX), so its main activity was to provide audiovisual content to these channels. They also offered news coverage for the mainstream channels, although their contributions were minimal. However, when Canal Extremadura TV started broadcasting, both companies decided to work for the new client. Although they produced other programmes in their early days, currently they are not part of the portfolio of clients of the public body. Following the line of the abovementioned companies, they are SMEs of between 10-15 workers, including permanent and temporary employees. At this point, in 2001, Atlas, a national news agency belonging to Mediaset España, established a headquarters office in the capital of Extremadura, Merida to offer news coverage of the region for the mainstream networks, primarily for its media group. However, this headquarters, which only had four workers (two for weekdays and two for weekends), closed in 2005. The reasons were the creation of the Autovía de la Plata highway, which passes through Extremadura and facilitates communications with the community of Madrid and the region of Andalusia and the imminent launch of the Extremaduran regional television network, which could provide audiovisual content to these networks. Another cause is Mediaset’s change in programming policy at that time which involved replacing informative spaces with entertainment content. With the presence of Atlas in the region, the news coverage provided by the Extremaduran production companies to the national networks fell sharply. 2002 saw the launch of Gestorex, dedicated to the production of ads and event production. Like the others, it is an SME with around 10 workers at first. Eventually, the production company adapted to the new changes and also offered training through own courses and the Extremaduran Public Employment Service (SEXPE). Between 2000 and 2005, the Junta of Extremadura, in collaboration with several of the aforementioned audiovisual production companies, studied the regional television model to be implemented in the community, so that many of these companies were heard and participated in the creation of this model. This was one of the reasons why a new audiovisual production company, C30 Producciones, was born in the region in 2005. The objective was to produce for the long-awaited regional television network and proof of this was the more than eight formats that it has produced for the regional corporation. During these years the existing production companies looked forward to the start of broadcasts to get contracts while others saw the market possibilities and created new companies. Thus, in 2006, Canal Extremadura Televisión started broadcasts and new companies appeared: Teyso Media Extremadura (2006), Viernes Producciones (2006), Dosde Extremadura Media (2007), ACC Producciones (2008), Digitsuit (2008), Carlos Pérez (2008) and Orange Productions (2008). All of them were launched with the same objective: produce content for the new TV network. In addition, they all were SMEs with a workforce of 10-15 employees, like the other companies. However, it is necessary to note that their individual evolution has been different: while some have become stable in the market, like Viernes Producciones and Dosde Extremadura Media, others like Teyso Media Extremadura and ACC Producciones have experienced more ups and downs over the years. Teyso Media Extremadura merged in 2010 with an Andalusian company, ATN, which meant an increase of capital to the Extremaduran company that favoured the emergence of new lines of business. Viernes Producciones and Dosde Extremadura Media, from the beginning, have been closely linked to the regional channel, producing numerous TV shows. This working relationship has caused, throughout the years, an increase in the workforce of these companies, although without exceeding the threshold of SMEs. ACC Producciones has been at the service of the regional network since its inception and until it was forced to be absorbed by Secuoya in 2013. Since 2008, ACC performed the news coverage of the network, offering work teams in five delegations spread strategically across the community. It has one the largest workforces, of about 60 employees. Regarding Digitsuit, in his early years it focused on visual technology and equipment rental and had with a minimum number of workers. In 2016, it started to produce audiovisual content for Canal Extremadura. Digitsuit Extremadura merged with Digitsuit Andalusia to form one of the companies with the most presence in the Andalusian audiovisual scene. Carlos Pérez, director, producer and director, created some audiovisual content for the regional channel in its early years, mainly documentaries. Pérez, along with members of the production company Tierra Digital (1988) created a new audiovisual company in 2014: 1080 Líneas Producción Audiovisual, which focused on the production of documentaries. Orange Productions was born in 2008 in Extremadura, but it is currently part of Colours Communication Group, a company with great international impact. Few years later, in 2011, many other production companies appeared: Canovision (2011), Nova Toma (2012), Periferic Tv (2012), Aire de Toros Producciones (2013), Gaia Media Producciones (2013), 1080 Líneas Producción Audiovisual (2014) and Synopsis (2014). Tierra Digital, launched in 1988, is included in the figure to estimate all the number of all the production companies existing in Extremadura, although it has not been considered in the analysis since its audiovisual production has been intermittent throughout the years and it no longer exists, just like one of the deans of the region, Iris Eyex Producciones. Therefore, according to the graph and the two discarded companies, there are 23 Extremaduran audiovisual production companies currently operating in Extremadura. This means that the number of companies operating at the beginning of 2000 has quadrupled. We have to remember that in 2006 Canal Extremadura TV started broadcasting. The graph shows an increase in the number of audiovisual companies in operation in the years immediately after 2006. From 2009 to 2012 there is a stage of stability, but from 2013 onwards new companies started to emerge once again. Thus, audiovisual production companies have adapted to the characteristics of the market at all times. Initially, and in the absence of private initiatives in the region, most of them focused on contracts with the government, producing short films with regional subsidies and, in some cases, they look for customers outside the borders of the region. As mentioned, this situation changed when Canal Extremadura TV emerged. The existing companies focused their efforts on the new client and tried to dodge the new competition, seizing the expansion of the sector in the region. The audiovisual structure had little to offer to its elements at the beginning of the new century mainly in economic terms, however, the addition of a new element caused changes in all others, not only economic, but also social and political as we will see below. To understand the dates presented it is necessary to delve into the history of the regional channel. In 2004, the Official Newspaper of Extremadura announced the appointment of the Director General of the Public Extremaduran Corporation of Audiovisual Media (CEXMA), which includes television and radio. The person chosen was Gaspar García Moreno. At the time, the Socialist Party ruled in Extremadura at the hands of Juan Carlos Rodríguez Ibarra, who after six legislatures had delayed, as much as possible, the creation of a regional television channel. The regional elections of 2007 favoured once again the PSOE, but this time the President was Guillermo Fernández Vara. The new president only ruled for a legislature, and in the next regional elections of 2011, the Popular Party, with José Antonio Monago in command, won the Presidency of the regional Government of Extremadura for the first time in the history of democratic region. However, 4 years later, the Socialist Party won the regional election in 2015, with Guillermo Fernández Vara. During these years and with the aforementioned regional government changes, CEXMA had three Directors: Gaspar García Moreno (2006-2011) former Head of Communications in the Badajoz Provincial Council between 1991 and 2004; Beatriz Maesso (2011-2015), who held positions of responsibility in national production companies such as One Film or New Atlantis; Carmen Garaicoechea (2015-2017), a former communication consultant for several companies at the national level; and Urbano García (2017--), former director of Radio Televisión Española Extremadura. During the different stages of the various Directors, the hiring of services varied considerably. During the administration of Garcia Moreno there were two main forms of hiring: audiovisual companies presented proposals to the network to be assessed or the network directly asked the companies to produce content for it. With the arrival of Maesso, the procurement models changed: they were carried out through public tenders, which were won by the company that got the highest score. These tenders have been published on the Transparency Portal of this company. Garaicoechea continued using this procurement model until his resignation in June 2017, due to disagreements with the regional administration, the loss of mutual trust and several conflicts derived from the negotiation and procurement of services of external production companies. During the Government of the Popular Party, Maesso management of the CEXMA was very criticised by the opposition, which pointed out that the hiring of external production companies did not enhanced Extremaduran production. The following table shows the hiring of Extremaduran and non-Extremaduran production companies throughout the history of Canal Extremadura TV. As we can see, from the beginning Canal Extremadura has hired non-Extremaduran production companies, although it increased with variations over time. However, the presence of these audiovisual production companies lies more on the size than on the number of contracts. During the stage of García Moreno, the nationally renowned company Europroducciones was present in the regional television channel for more than four years with formats such as “Grand Prix” and “Qué apostamos”, and especially with the production of exclusive content for the network, such as “Entre vinos”, “Hoy en día” and “El día es nuestro”. In addition to Europroducciones, there were other non Extremaduran production companies collaborating with network, but with less hours of programming: Catorce, Transglobe, MSL Group, Grupo Zeta and Plural, among others. Maesso opted, as mentioned, for a new form of procurement for programme production that opened up the range of participation opportunities. On 31 March 2014, a public tender for nearly 1,000 hours of programming was launched. 15 companies attended three different groups formed according to criteria of periodicity, genre and format. The winners were: Factoría Plural in Group A with 482 hours; Exit, Trímboli, La Cometa Producciones in Group B with 322 hours; and Viernes Producciones in Group C with 123 hours. A year later, in 2015, a new contract was awarded to Factoría Plural to produce most of the contents of the network over the next two years, amounting to € 4.5 million. Therefore, between 2013 and 2016 non-Extremaduran production companies got to produce most of the content of Canal Extremadura TV, with programmes such as: “Puerta con puerta” and “Mujeres.son”, produced by Factoría Plural; “Una vida mejor” and “Objetivo” produced by Erpin 360; “Escúchame” and “Educad2” produced by Balance Productions; and, “Mercadillos” and “Reporterox” produced by Exit, Trímboli and La Cometa Producciones; among many other programmes. The presence of these non-Extremaduran production companies has been remarkable in Canal Extremadura TV, reaching more than thirty different formats from 2012 until today. Although the years between 2013 and 2016 stand out in this regard. For their part, Extremaduran audiovisual production companies remained linked during this time to the regional channel trying to get long-term contracts. For example, Trovideo produces “Tu Empleo” since 2006 while Dosde Extremadura produces “La Besana” since 2008. However, these are two of the few examples that can be highlighted in terms of long-term contracts. “In these 11 years, programming has varied considerably, with Garcia Moreno broadcast programmes tended to last more, up to 4 and 5 years, such as “La tarde de Extremadura”, “La sala eléctrica”, “Ecos”, “Zona Empresa” and “En su punto”. This changed radically with Maesso and Garaicoechea, who made shorter contracts, with the exception of the network’s flagship programmes: “Escúchame”, “Extremadura, tierra de toros” and “El lince con botas”. Therefore, throughout these 17 years Extremaduran production companies have not only had to compete with each other to stay afloat but have also had to deal with ‘‘foreign enemies”, which usually have greater economic capacity and resources. This enemy has been present since the birth of the regional television channel and became more visible with the arrival of Beatriz Maesso to the executive management of the CEXMA, through its new contract-awarding policy. Thus, the picture was bleak for these audiovisual companies at the beginning of the new century, while the current situation has improved but is not ideal. At first, the small production needs in the region were shared between few companies, which tried to differentiate from each other to win a greater market share. So, as mentioned, the birth of the public channel was a breakthrough in the sector. However, this progress has been out of control, given that the number of companies that emerged is larger than necessary, and the public body does not require content from each and every one of them more or less equally. However, on the other hand, the development has also been controlled, since precisely this regional channel controls the growth of each of these companies based on the contracts awarded and even controls their existence, given that if Canal Extremadura TV does not give a Extremaduran company a contract in 2 or 3 consecutive years, this company will go bankrupt, unless it manages to reinvent itself. 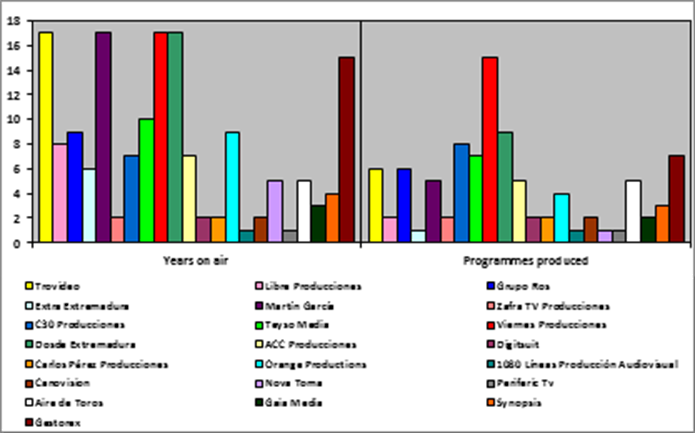 As the previous chart shows, the audiovisual companies with programming with more years on Canal Extremadura TV are: Trovideo, Martín García Chamorro, Viernes Producciones, Dosde Extremadura Media and Gestorex. Meanwhile, those companies that have produced the largest number of outsourced programmes are: Viernes Producciones, Dosde Extremadura Media, C30 Producciones, Gestorex, Trovideo and Grupo Ros. Therefore, the audiovisual production companies who were born along with regional television channel, such as Friday and C30, stand out. These companies emerged to take advantage of the new situation in the sector. They have not only managed to stay on time and get big contracts but have also become companies of reference in the sector, occupying the top of the list in terms of number of employees and annual profits. For example, Trovideo and Gestorex, which are the oldest, did managed to win a spot and survive over time despite not having been contracted to produce a large number of programmes over the years. However, with more or less air-time contracts, Extremaduran audiovisual production companies from the beginning have been at the service of the regional channel, which has become their main customer. Canal Extremadura Televisión contracts represent almost 80% of the activity of these companies, the remaining percentage usually accounts for institutional videos for different departments of the regional government of Extremadura. All of these companies saw the regional channel as a potential customer and competed in the market for a greater slice of the cake. Canal Extremadura TV led to an increase in the number of companies dedicated to this type of audiovisual production, an increase in the number of recruitment of professionals in the industry and an economic boom in the audiovisual market. However, this relationship of dependence between production companies and the regional channel weakens the sector, as it is almost at the expense of the decisions made by the executive branch in this area through the regional television channel. Therefore, the regional television channel has the economic control of all these audiovisual companies, and is therefore, the Junta of Extremadura (the executive branch) has this economic control. In addition, it should be noted, as we have seen, that the two periods that referred to the creation of the new audiovisual companies were: 2006 to 2008 and 2012 to 2014. It is clear that the first period has been due to the birth of Canal Extremadura TV in 2006, but and the second is not so clear. Let’s remember that the People’s Party won the 2011 elections, which resulted in a new general director for the CEXMA. This political change in the general management, the aforementioned new procurement policies and, above all, the new twist on the regional policy, i.e., in command of the Junta of Extremadura, encouraged new professionals to enter Extremadura’s audiovisual market. Finally, it is necessary to emphasise that these audiovisual production companies, which focused on the production of television content, practically do not have any business activity outside the Extremadura region. While some of them had collaborated in news coverage with mainstream channels, this occurred when there was no regional channel, and after its emergence the attention focused on the new client. In addition, the mainstream networks that require information about the region make their request directly to this public channel. Thus, audiovisual production companies limit their own growth when they marked Canal Extremadura TV as their only target. While it is true that within the Extremaduran audiovisual market options the major contracts are received from the regional television channel, it would be necessary to investigate new business lines, such as private and public initiatives, but with greater significance, and to enter new audiovisual markets in other Spanish regions. This would mean more flexibility when it comes to qualify for different contracts, higher growth and less reliance on regional channel. Based on the previous section, we can confirm our main hypothesis: the development of audiovisual production companies in Extremadura has been conditioned by the decisions made in this area by the Executive power in the region. The executive branch represented by the Junta of Extremadura, through different legislatures, has influenced the development of these audiovisual production companies. The first influential decision that stands out was Rodríguez Ibarra’s decision to delay the creation of the regional channel. While the majority of the Spanish autonomous communities had their own regional public television network, residents of Extremadura resorted to local broadcasters to obtain proximity news. These local television channels, as noted above, did not require the services of the Extremaduran audiovisual production companies, so they survived with minimum work. While the creation of Canal Extremadura TV was a breakthrough in the emergence of the audiovisual production companies, this progress has been limited and controlled in the recruitment, specialisation and professionalisation of personnel. It was controlled according to the requirements of the regional channel, which according to hiring policies some production companies, in such a way that the production company that was not hired by Canal Extremadura TV, or therefore got a smaller contract, had to go back to produce institutional videos for the Junta of Extremadura. In comparison with the rest of the Spanish autonomous communities and their audiovisual sectors, the evolution in Extremadura has been scarce given that 24 audiovisual production companies do not form a solid and nourished basis for an audiovisual sector. The comparison of this number with the firms existing in Andalusia is terrifying, as the neighbouring community has 1,200 enterprises registered in the audiovisual sector (Ramos, 2012). While all branches of the audiovisual sector are grouped together in this number, the number of companies exclusively engaged in the production of audiovisual content for television considerably exceeds its Extremaduran counterpart. However, this limited evolution responds to the production companies’ malpractice of depending on Canal Extremadura TV as their sole client. It would be necessary for these production companies to open their activity range to have more possibilities when they receive no contracts from the regional channel. Since its inception, Canal Extremadura TV has tried to promote the work of these Extremaduran companies, although that commitment has been more evident for some production companies than for others as different people was appointed to direct the channel. The change in the procurement model also showed a new stage in which Extremaduran production companies had to compete with large national production companies, who surpassed them in resources. It is necessary to indicate, that although after 2006 these Extremaduran production companies increased their professionalism, they never cease to be small businesses that increased their workforce according to the gotten contracts, but never reaching more than 30 workers, with the exception of the companies that performed the news coverage, ACC Producciones and Trovideo. Therefore, the evolution of Extremaduran audiovisual production companies directly depends on the wishes of the regional channel, which vary according to the CEO, who in turn changes depending on the party ruling the region. Most of these Extremaduran audiovisual production companies were created in response to the regional network’s need for audiovisual content, but they should have developed a greater line of business. To achieve greater development, increase their portfolio of clients and become non-dependent, Extremaduran companies must go beyond the borders of the region and offer their services to other autonomous communities and even its neighbouring country Portugal. In Extremadura, the clients are: Canal Extremadura TV and the Junta of Extremadura, through its many councils. A few private companies can also be mentioned but they are minimal. If these audiovisual companies got a greater number of contracts they could grow in professionalisation, specialisation and size. They could achieve their own objectives and not those set by the regional channel. The economic and political control exercised by the executive branch on Extremaduran audiovisual production companies through the regional television channel, must be added to the demographic characteristics of Extremadura. Given its great geographic dispersion and the sparse population of most towns in the region, the sector has not been able to achieve further development, due to its difficult centralisation. Therefore, the dependence on the regional channel is the main cause of the poor and weak development of the audiovisual production companies, which are facing a market that has changed over the past 17 years but still has the same main actors: The Junta of Extremadura, through its public television channel and councils. The approach of this study leads us to question, in the same way, how the emergence of the regional channel has affected local broadcasters in the region and how the emergence of regional radio has affected the day to day of regional and local radio stations, which are unattended areas of research. Ramos Rodríguez, E. (2012). Renovarse o morir: nuevos escenarios para la supervivencia de las productoras audiovisuales en Andalucía. A M Morales González (2018): “Development of audiovisual production companies in Extremadura in the 21st century”. Revista Latina de Comunicación Social, 73, pp. 790 to 809. Article received on 18 February 2018. Accepted on 20 April. Published on 24 April 2018.